My feedback oriented around the fact that being CEO meant being a leader. And in being leaders we have to be strong enough to make tough decisions, to do what is in the best interest for the long-term health of the company first, and only secondly what is best for any one individual on the team. A CEO must protect their organization, especially from itself. It is up to the CEO – and all executive management as the organization grows larger – to place and remove individuals as they see fit. Most importantly a leader must be able to determine if an individual is adding more value to the organization than it is taking away. If not, that person must be removed or placed in a more appropriate role immediately. This includes the CEO himself when he is skirting from his responsibilities. In this specific instance, the CEO felt the individual in question was a net negative on the team and was a growing concern, even starting to split the team during meetings, discussions, etc… He was obviously very concerned. Most decisions a CEO will face won’t feel good or be easy to make. It gets even more difficult when we involve highly talented individuals. Sometimes it might seem counterintuitive to actually remove a highly talented individual from a team, yet if the value they bring to the table is being overshadowed by the value they are taking away (or could potentially take away) with their detrimental behavior, something must be done. That or the entire team will fall as a result. It’s the leader’s responsibility to make these decisions before its too late. This is why I argue it is never too early for a startup to have a CEO/Leader in place. I dovetailed the conversation a bit to illustrate my point. Just last week the Seattle Seahawks (I live in Seattle and I’m finally proud to be a fan again) played the Washington Redskins in the NFC wild card playoff game. If you were watching the game you know exactly what happened. And a crystal clear lesson in leadership played out in front of the entire country on national television. I sure hope others took note. Robert Griffin III (or RG3 as many know him) won the Heisman trophy last year with Baylor and was drafted 2nd overall by the Washington Redskins and is believed to be their franchise quarterback for many years to come. They signed him to a 4-year, $21 million salary with the entire deal guaranteed, meaning he gets ALL $21 million no matter if he plays or not. Obviously, this is a huge investment for the Redskins. You would think they would have treated him as such during his first season with the club. RG3 strained a ligament in his knee on Dec 9th and sat out a few games but came back early to play the last game of the season and the playoff game against the Seahawks. During the playoff game, it was quite obvious RG3 was not 100% and his leg was definitely in pain. He was “playing hurt, not injured” as they say. What happened next was all things fascinating (from a leadership perspective), lucky (for us Seahawks fans) and excruciating (as I feel bad for Griffin) to watch. Early in the game Sunday RG3 tweaked his right hurt knee again, to the point of limping, wincing and running with an impaired gait. It was obvious he was injured and should not have continued playing. Even the announcers were wondering when the Redskins will pull him out for the betterment of his health. Numerous times, the television cameras showed RG with assistance from trainers and medical personnel, walking into a “small room” for who knows what, but my guess is examination and possibly a cortisone shot (pain reliever) so he could drag himself back onto the playing field to continue playing. And that he did. According to sources, it was his decision and he absolutely wanted to play the rest of the game even though he was a shell of his previous self. OF COURSE THE YOUNG STAR WANTED TO PLAY. Anyone high performance individual is going to want to continue, especially when we are down or struggling. We all want to prove we can overcome obstacles and be champions in the face of adversity. As the game continued, the Seahawks eventually took the lead. It was then, as the Redskins were doing all they could to win, RG3 awkwardly bent down to grab a bad snap only to fatally injure his knee; looking as to have seriously torn some ligaments in the process. Injuring a previously weakened knee on a play where no one touches you, referred to as non-contact, is an obvious sign you shouldn’t have been playing. Not RG3’s. The problem is the person involved is not thinking clearly or wisely at the moment. They are focused on themselves, considering only the moment and the short term, not the long term. They do not understand the long-term ramifications of their actions. Even though RG3 said he could still play the responsibility to make the right decision ultimately falls on the coach, the leader of the team. He should be realistic enough to make the right decision. In the case of RG3, his head coach and somewhat the CEO of the organization, Mike Shanahan, is the person who should have been thinking about the long-term consequences of what was transpiring in front of him. But for some reason he wasn’t thinking clearly either, perhaps wanting to roll the dice and gamble to win the game. His prize procession, the guy they gave up so much to draft and the one they touted as the future of the organization – their $21 million investment – placed himself directly in front of a Mack truck and no one did anything to stop him. What’s the point of having leaders if they are not looking out for their team? 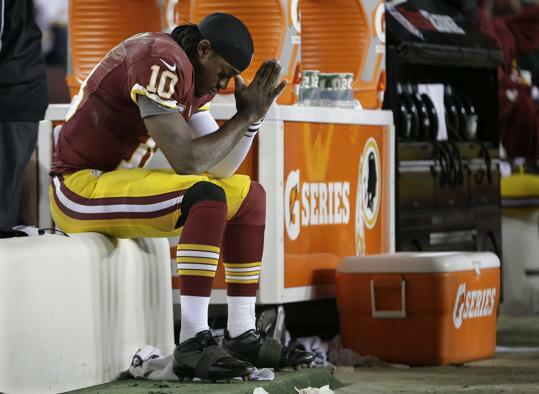 It’s easy to understand why Shanahan chose to leave RG3 in the game, he’s a good player when healthy. It was reported he repeatedly told his coach he could play. He said “I’m hurt, not injured”. RG3, being a rookie, could be passed for naïve and maybe didn’t fully understand his actions had such drastic consequences. But Shanahan, a veteran coach and the leader of the organization, should have known this and put his fist down. It is his responsibility to make the tough decisions and do what is right for the entire team. The truth is his lack of judgment in the heat of competition has not only cost the Washington Redskins a playoff win, it jeopardized the future of the organization since the resulting knee injury will lead to months of recovery time and RG3’s promising future now looks a bit more unclear. Like it or not, the fault always goes to the leader. To win one playoff game (short term) Shanahan could possibly have just given up the entire next season (long term) with his gamble. But more importantly, Shanahan’s lack of leadership has now altered the life of one of the most promising young athletes to enter the NFL in a long time. There is a strong possibility RG3 will never be able to perform at the level he was previously, in the end maybe even costing him millions of dollars and lost opportunities. Leaders must have the courage to do what is right not only for the organization but each individual within it, even if it’s the most difficult thing they have ever done. I asked my fellow CEO if he thought Coach Shanahan would like to have that game back and possibly make a different decision? We both agreed and believe he would. As for his situation, I told him he needs to let the individual go, as soon as possible if he wants the rest of his team to stay intact. I told him the responsibility of his organization rests on his shoulders and he should strongly consider what happens if he doesn’t make this tough decision. “Everyone else on the team is watching how you handle this situation”, I told him. I also suggested he owes it to the individual to be upfront and honest so they know what is happening as well as to free them up to go pursue their goals as soon as possible. CEO’s must protect their organizations, the people within them as well as themselves by making tough decisions. Problems are solved by tackling them head on, not by running away from them.